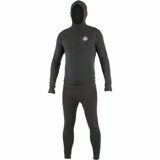 The Ninja Suit is the original hooded base layer suit. This one piece with zipper separator is the ultimate in base layer performance. Brilliant design , performance and fit in the Airblaster Ninja Suit.